Jared Unzipped: My Top Six Favorite Generation III Pokémon. I've previously reported on my top six favorite Generation I and Generation II Pokémon. With every new generation of Pocket Monsters to choose from, there's always those six standout creatures that really catch my attention. And now, I present to you my top six favorite Generation III Pokémon! 6. Flygon - An unsuspecting Ground and Dragon type, Flygon is easily underestimated by your opponent. 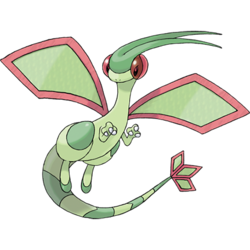 Sure, Flygon is small and not what your typical Dragon type looks like, but don't let that fool you. Having the Levitate ability automatically shields it from Ground type attacks. With access to moves like Dragon Rush and Draco Meteor, you can easily devastate an opponent that's weak to Dragon type moves. Flygon's stats are well-rounded and it's reasonably fast, too! 5. Swellow - Another zippy, super fast Pokémon that an opponent might scoff at... but that's their own problem to deal with. 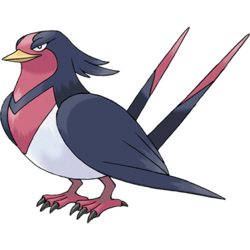 Swellow has a high Speed stat and a fair amount of Strength, making it perfect for dealing damage quickly to an opponent with low defense. I prefer using moves like Sky Attack, Boomburst and Fly (which serves a dual attack/transportation purpose). 4. Torkoal - Finally, a Fire type Pokémon that I can get behind! 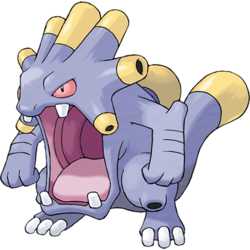 Torkoal has a ridiculous amount of Defense and can usually handle any sort of physical attack (unless it's Water, Rock or Ground type). 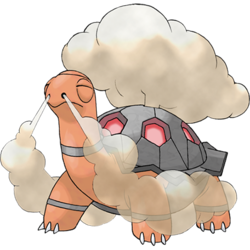 Torkoal is great for stone-walling a striker opponent. Plus, it's nice to have a Fire-based attacker with access to moves like Inferno and Heat Wave. For added damage, use a 1-2 combo like Facade with Will-O-Wisp! Your opponent will be left begging for a cool drink of water when you're done with them! 3. Zangoose - This Pokémon is deadly in the right hands. 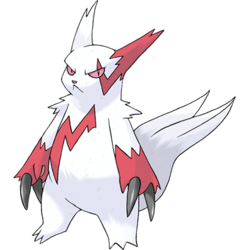 Though only a lowly Normal type, Zangoose can dish out some massive damage with the correct move set, thanks largely to its relatively high Attack and Speed stats. I generally employ moves like Counter, Sword Dance and Crush Claw to bring an opponent down. Zangoose is a lethal assassin, given the chance! 2. 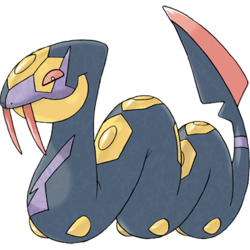 Seviper - Poison is my favorite Pokémon type, so it's no surprise that Seviper is on this list. With high Attack and Special Attack stats, Seviper is readily equipped to launch pretty much any offensive maneuver successfully. I like to use the classic Toxic / Venoshock move combo. Along with moves like Gastro Acid and Haze, Seviper can immediately reset the course of a battle and even the playing field. Seviper is simply awesome! 1. Exploud - When I first played through Pokémon Sapphire in 2003, Exploud was my strongest and most heavily used Pokémon. It seemed like nothing could stop this Normal type terror! That stands for good reason -- Exploud has moderately high Attack and Special Attack stats and a lot of hit points. Boomburst is a powerful attack that can deal incredible amounts of damage. Because of its high HP total, don't shy away from using the Rest / Sleep Talk combo to deal extra damage while on the mend. Exploud is a great wall that can outlast your opponent if necessary. It also has the ability to learn a lot of TM and HM moves, making it easily customizable to whatever task you require of Exploud. This Pokémon is a durable and versatile trooper!